BOURNEMOUTH Symphony Orc­hestra has joined up with Allianz Musical Insurance to search for a Young Composer-in-Association, and you have until Friday 10th May to apply. The competition is open to UK- based composers aged between 18 and 30. The winner will have the opportunity to develop her or his compositional technique and experience in a year-long association with orchestra’s renowned disabled-led ensemble, BSO Resound. 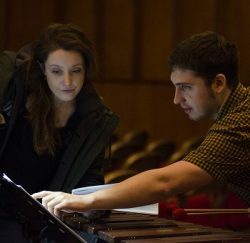 The Young Composer-in-Assoc­iation will work with and compose for BSO Resound, benefitting from professional mentorship from Composer-in-Resid­ence Alexander Campkin, as well as receiving a £500 bursary. As well as composing for the traditional instruments in the ensemble, the will will be able to develop skills in working with new instruments and Assistive Music Technology as well as learning about composing for an inclusive and accessible ensemble. BSO Resound’s Young Composer-The BSO welcomes applications from composers who would define themselves as disabled. The deadline for applications is Friday 10th May 2019 at noon.